It isn’t just the beaches – which sure are numerous and beautiful – that make the city state of Goa such a tourist magnet for Indians and foreigners alike. It is also its vibrant culture. A culture that is a mix of the local Goan eclectic Indo – Portuguese history juxtaposed with the bohemian spirit inherited from a long line of trippy tourists who have made Goa their home. With its picturesque forts and historic churches, hip flea markets that run shoulder to shoulder with chic boutiques, trendy cafes along treelined avenues, Goa has something of interest to every kind of traveller. So, here is a quick guide to travelling through Goa. From where to eat to what to see and do on your first trip to Goa. You cannot be in Goa and not have seafood. And it is said that it couldn’t get better than the Goan Fish Thali at Fat Fish, where, for once, you will see just as many locals as tourists relishing in the distinctive Portuguese flavour of Goan cuisine. Yet another favourite of the locals and celebrities alike is the Exotic Seafood Platter at Martins Corner. And as for vegetarians like me, head to Casa da Moeda late afternoon for high tea and be regaled by the hosts who dish up some some local Goan anecdotes with a side of tea and cake. Originally Goa’s Mint, currency was minted here a hundred and eighty four years ago. Today it is the Dias family’s home and one can visit with a prior appointment. Also, if you happen to be in Goa on a Sunday, then the brunch at Villa Blanche Bistro cannot be missed. For here you are not just spoilt for choice with the variety of bagels, pretzels and cheeses on offer. Vegetarians can dig in to a sumptuous meal too, thanks to their exclusive vegan and gluten free menus. While North Goa is known for it wild parties and crowded beaches, South Goa is for those looking for the quieter beaches to spend a lazy afternoon. So beach hopping from North Goa to South Goa should surely be top of your itinerary for Goa. From Anjuna to Baga, every beach you have heard of is in North Goa. If you love chasing sunsets, then the Anjuna Beach with its swaying palms and rocky cliffs is the place for you. It is also here that the famous Flea Market is set up, every Wednesday. But if you want to indulge in some people watching, then the Baga beach is where everyone is at. Calangute with its uber cool eateries and shacks is the queen of Goa beaches and also its most crowded! The Miramar beach is to Goa, what Chowpatty is to Mumbai! Miramar is also known for its stunning views of the Fort Aguada. And, how can you miss the beach made famous by that iconic scene in Dil Chahta Hai ?! It is the Vagator Beach and Chapora Fort then. Agonda used to be so quiet that the Olive Ridley turtles used to nest here. But with South Goa rapidly making it onto the tourist radar, Agonda has become its most popular beach. Today, it is people and beach shacks that crowd out this beach. Though the Palolem Beach is yet another popular beach in South Goa, quickly being overrun by eateries, boutiques and restaurants; I still love its vibe. There definitely is something about Palolem, which is probably why it is the setting for silent night parties every Saturday. Remember that song in Ae Dil Hai Muskhil – where you dance to your own music in a club? The second most popular thing to do in Goa, after beach hopping is to see the churches and convents of Old Goa. Or Velha Goa – as it is known locally – the old Portuguese capital. The whole of Old Goa is a UNESCO inscribed world heritage site and rightfully so. For these churches and cathedrals were built right after the Portuguese came to Goa in 1510, with a view to inspire awe amongst the native Indians. So that they would more readily accept Christianity. See them not just for their striking architecture that varies from Portuguese – Gothic to Tuscan and Corinthian, but also to visit the mausoleum of Goa’s patron saint, Francis Xavier, housed in the Basilica of Bom Jesus. Take the Fontainhas Walking Tour to explore the oldest surviving Latin Quarter in Old Goa and the only living one in all of Asia. Whimsical and colourful, this walk takes you through narrow alleyways of charming old traditional homes painted in hues of yellow, blue, maroon and green. And, it sure is going to transport you to another time right there in the middle of the bustling city of Panjim. 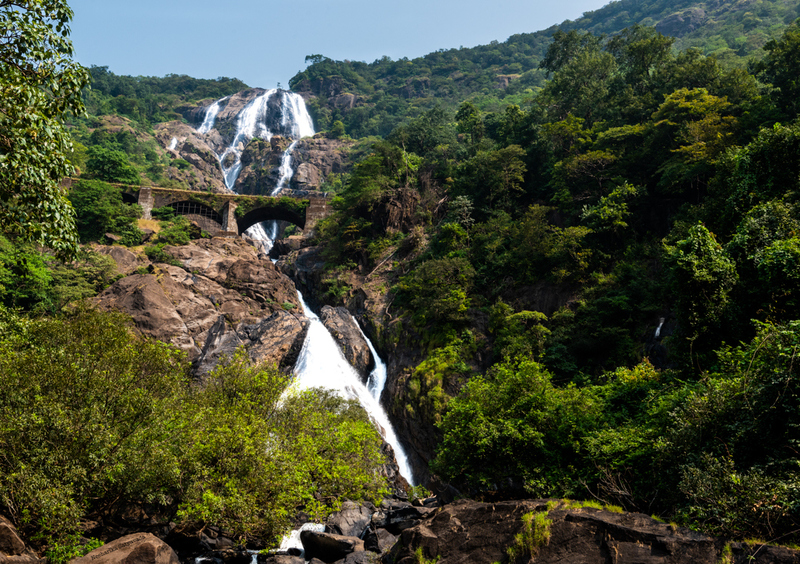 Trek to the popular Dudhsagar Waterfalls and explore the luxuriant green forests of Goa, when you tire of its countless beaches. Visit the Sunaparanta Goa Centre of the Art. Beloved of the art lovers in Goa, this not-for-profit arts initiative is more than just a gallery and cafe. Sitting in an old Hindu Portuguese house, Sunaparanta serves as a hub for Goa’s cultural events. There is also a library here that is a great resource for anyone looking to delve deeper into understanding art. Cycle on the Divar Island where beautiful little Portuguese villas dot every winding lane. Here on the island is also the Church of Our Lady of Compassion that boasts stunning panoramic views of the Goan countryside. Take a sunset boat ride on the Nerul river. Check out the Literati Bookshop and Cafe in Calangute to browse through some antiquarian books or just for some coffee and conversation in the garden cafe of this store that has been featured in lists of the Greatest Bookstores of the World.